Sodium Lauryl Sulphate, or SLS for short, is a surfactant. This means that it may act and be used as a detergent, a wetting agent (so it has less friction on surfaces), emulsifier (keeping two compounds together), and most commonly as a foaming or sudsing agent. In its original form it is called Sodium Coco Sulphate (SCS) (see below for more). 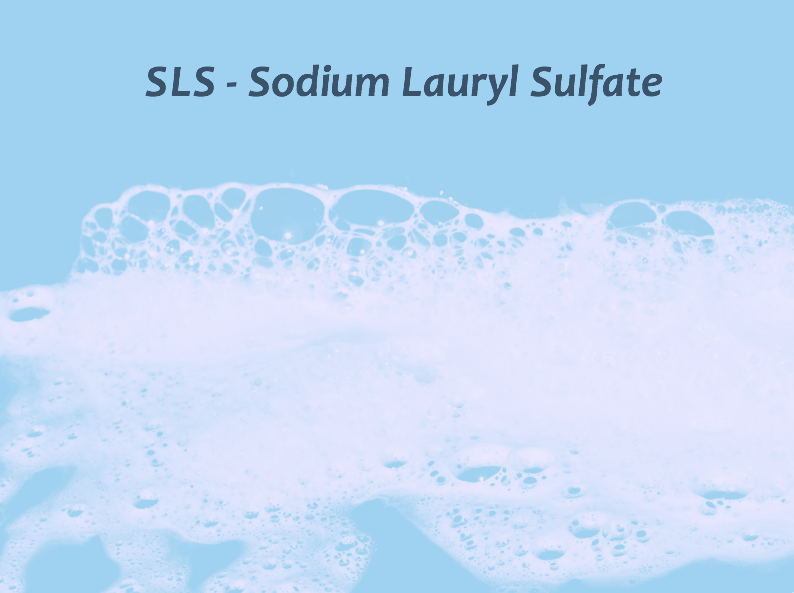 SLS can be found in everything and anything that is designed to, or claims to be a detergent or foaming! That means it could be present in your floor cleaner, toilet cleaner, your hand wash and even your face wash. A very common place to find it is in Shampoo! It may also be present in your makeup, including foundation, and even in your toothpaste. As mentioned above, it is used for a number of properties including creating the foam in products, as an emulsifier to keep products that have oil and water ingredients, for example, stable and reduce separation. It is also a detergent which is why is is commonly used in cleaning products from household items to skincare. When the chemical SLS undergoes the manufacturing process of 'ethoxylation'* it creates ethylene oxide and 1,4-dioxane two toxic chemical by-products which can be absorbed into your skin and may cause issues with respiration, your kidneys and even cancer. SLS is known to be an irritant and can cause irritated skin and scalp, dryness and inflammation. This can lead to dandruff and other aggravated skincare issues including dermatitis and forms of eczema and psoriasis. SLS in toothpaste is also thought to be a strong cause of many mouth ulcers. *Ethoxylation is a process that turns SLS into SLES, a milder and more foamy form of SLS. It was thought to be less of an irritant but research shows it still causes the same issues just to a slight lesser extent, plus the process creates the two by-products ethylene oxide and 1,4-dioxane which are just as harmful and carcinogenic. Pheww that's a lot of names! SLS is similar to SLES and ALS. They all have relatively the same function but vary in strength and mildness and have gone through slightly different processes. I will address these chemicals in other posts. As mentioned above SLS is originally sourced from coconut oil and then goes through heavy processing. In its original state the oil can be put through a lower and less chemical laden process that results in what is called Sodium Coco Sulphate in this state it is found to be a safer ingredient. Yaaay! So you can still have foam and fun! (Although there is plenty of argument about this so its good to do some background on it). Questions or alterations/extra info? Pop them in the comments and i'll do my best.